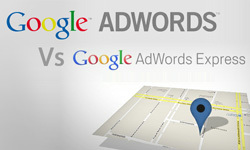 AdWords VS AdWords Express: Where Should You Spend Your Time? AdWords can gain you instant web visibility with the click of a button. But many of the times it’s the type of web visibility that you just flat out don’t want. Click fraud and other types of wasted clicks can just dwindle your bank account away within minutes. AdWords is worth it – sometimes. But it’s hard. And the time you have to put into it to make it a worth-while type of campaign can sometimes just flat out not make it worth it at all. Of course is all about what type of niche you are in and what your goals are as a company in terms of building brand awareness (cost per one thousand impressions on the display network) and lead generation (cost per click). AdWords Express is AdWords made for small businesses that don’t have the time, budget, or Internet savvy to sit around and mess with their AdWords accounts all day or outsource it to a third party Internet marketing company to do it for them. It is computer generated and it runs automatically right from your Google places accounts (which have now become Google plus accounts as of May 30th). 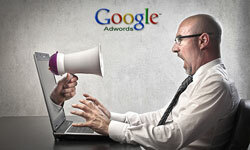 AdWords Express campaigns have advanced ad listings. You will show up on the map as a blue marker and you will have your reviews listed along with your ad as well as your location and your phone number. Because of this AdWords Express campaigns can have much higher click through rates and conversions at the 4 and 5 positions of the Ad listings which makes them great for any business whether you are running a campaign for an HVAC company or a company that provides self storage in Key West. They tend to stand out more, and there for you don’t have to pay the big bucks to get at the top of the listings (above the fold) as they perform perfectly well at the right side of the natural listings. They may even get the same click through rate at the 4 and 5 positions as a regular ad would get in the 2nd and 3rd slots above the fold. Google has the perfect system -the perfect system for making you spend tons of money to get better quality scores that is – the way that Google determines your ad rank. Sure Google says increasing your bids doesn’t lead to better quality scores, but since click through rate is a major player in increasing your quality score and you increase click through rate by increasing the bids on your keywords so you can get a higher ad position you can actually in theory increase your quality score by raising your bids. If you don’t have a high quality score, it seems that you are absolutely screwed. Another big player in the quality score category is the history of your account, so the only way to beat the system is to raise the bids on your keywords, which in fact is not beating the system at all. You could try making amazing banner ads and then running CPM campaigns on the display network, but I would advise you just to stick to AdWords Express and spend absolutely NO time getting clicks while still getting conversions. This article was written by Jet Russell. 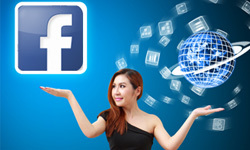 In his spare time he likes to blog about all things that have to do with Internet marketing as it is his passion and has been his career for the last three years. @Eddie Patin – As far as I understand, Ad Words Express will target your ads for you, based on your geographical location, so there’s no need to worry about someone in New York seeing your ad and clicking on it. I read this article while researching adwords express for my house inspector firm. Helpful thanks. One thing I haven’t been able to figure out is, it seems that adwords express has a problem of using automation and wasting a lot of budget on irrelevant clicks. So I wonder how bad that was is from one category / industry to another. Like, with my business offering ‘Colorado Springs Home Inspections’, would it limit its advertisements to when people search for “Colorado Springs Home Inspection”, or would it also offer the ad to people across the country looking simply for ‘home inspections’? I think I might end up just learning regular adwords instead.